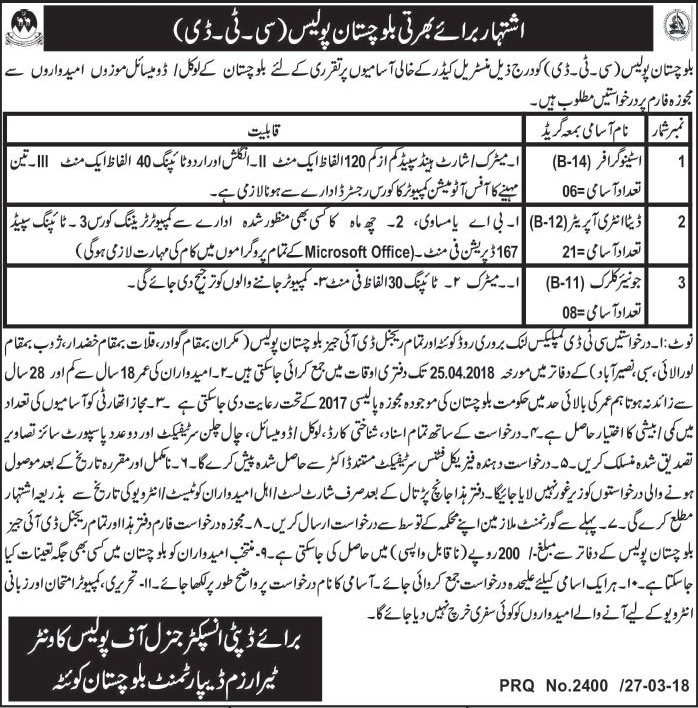 Balochistan Police has announced 35 New Jobs in Counter Terrorism Department Published in Daily Jang Newspaper 28th March 2018. Candidates who fulfill the required Criteria may apply for CTD Jobs 2018 as Stenographer (BPS-14) 06 Posts, Data Entry Operator (BPS-12) 21 Posts and Junior Clerk (BPS-11) 08 Posts. Prescribed Applications form can be collected from all Regional DIG’s Balochistan Police Office worth of Rs 200. Selected Candidates will be posted in any place in Balochistan. Incomplete or late received applications form will not be entertained. No TA/DA Will be admissible to any Candidates.